Enjoy a musical concert of Brahms Op. 40 Trio performed by Joanna Grace (horn), Vivian Kukiel (violin) and Chris Au (piano). 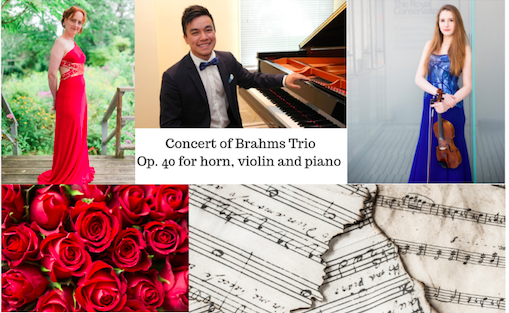 Birthdays, Mothers and the Music of Brahms also includes historical commentary on Richmond Hill’s roses by Norman McMullen, Past President of the Garden & Horticultural Society. Question & Answer with the Musicians Included. This event received support from the Richmond Hill Community and Cultural Grant Program. 1) How can I reserve some seats? Seats are available online for $20 until May 3. Once purchased, bring your printed ticket with you to the concert and choose your seats once you arrive. Additionally, tickets at the door can be purchased for $25 cash only. (Exact amount is appreciated.) This event is best suited for those 12+ years old and those who can sit quietly for an hour. 2) Is this location fully accessible? Yes. 3) Will I get to meet the musicians? Yes, at every concert Joanna Grace coordinates, there is a Question and Answer period to bridge the gap between the audience and performers. 4) How can I contact the organizer with any questions? Email Joanna Grace joanna@joannagrace.ca or Call 647-701-8421, at least one day before the concert. Otherwise, please arrive 20-30 minutes before start time to ask your questions of a helpful volunteer on location. Thank you!